How Much Return Can You Expect From Stock Market? 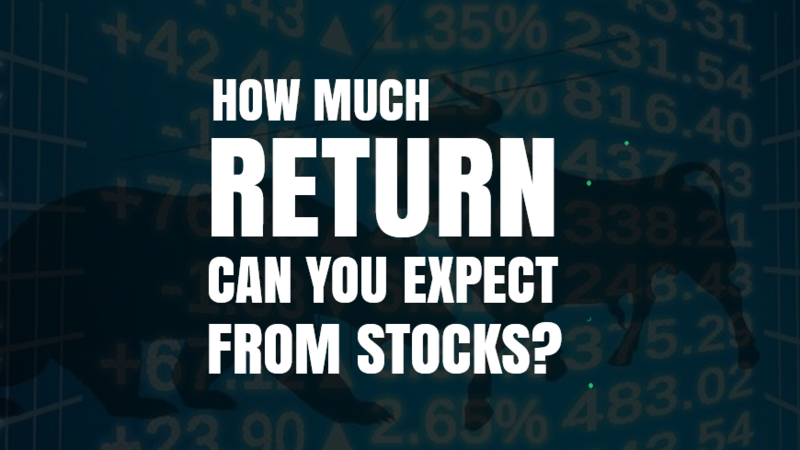 How much return can you expect from stock market? Most of the people enter the stock market with the sole purpose of making money. 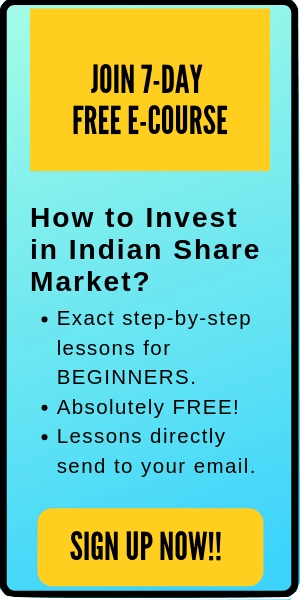 Inspired by the veteran billionaire investors like Warren Buffett, Rakesh Jhunjhunwala, RK Damani etc, they also want to try their knowledge and luck. However, while most people dream of making huge fortune from the market, they end up losing money. This end is mainly because the newbie investors do not know what return they can expect from the market. A common investor enters the market with some arbitrary goals to double or sometimes quadruple his/her investment in six months time duration. But in the real case scenario, even the best investors cannot achieve this big goal in that short amount of time. I do not blame just the retail investors for those surprisingly high return expectations. There are many agencies who inflate their thoughts like media, stock brokers, fraudsters etc. For example, everyone knows the story of Mr Rakesh Jhunjhunwala about how he bought the stocks of Titan Company at Rs 3, which is currently trading at Rs 600 level. This news, which is commonly circulated by the media drives the high expectations of the common investors from the stock market. Nevertheless, what about the other stocks in Rakesh Jhunjhunwala’s portfolio? Do you know how much return his other stocks gave? Do you know what percent of net portfolio was allocated for Titan Company by Mr Jhunjhunwala? He has more than at least 20 stocks in his portfolio. If few stocks have given him multiple time returns, then few might also have been in loss. The average portfolio return will surely come down if we calculate the cumulative profits and gains of all the stocks. Still, people ignore to know the complete facts and expect to get huge returns from their investments in six months just like Mr Jhunjhunwala. Then comes the stock brokers. The brokers encourage the investors to invest in some stocks that they suggest as a multibagger stock ( Multibagger are those stocks which give multiple times returns compared to initial investment). But how come the brokers do not buy the same stocks in bulk and make millions if they are damn sure if it’s going to be a multibagger. Instead, they just advice to buy those stocks to their clients suggesting them that the stocks will make huge fortunes for them in short amount of time. And lastly comes the fraudsters. Some fraudsters’ claims to give 60-80% return in six month. You can find a number of such stock advisors if you simply google- best stock market recommendations in your area. These fraudsters even claim to give 99% accurate suggestions. Unluckily, many common investors believe them and expect to get 80% returns in next six months. With all these things going around, a common investor keep his expectations way too high when they enter the stock market. If you say that you have earned 20% annual returns from the market last year, they will laugh at you and ask that why did you entered the stock market for this low returns then. They believe that one should enter the stock market only if they get high returns, say 50% per annum. However, there are many things that these newbie investors are missing out about the return you can expect from stock market. Let me focus some light on them. 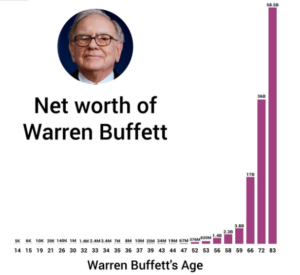 Warren Buffett has earned an average of 22% return per year for the period of almost 6 decades now. 99% of his wealth has been accumulated after an age of 50. Now, you might ask me that how the hell then Warren Buffett became the richest man in the world. The answer is simple. It’s consistency and patience. Consistency because he got an average return of 22% year after year. Patience because he did it for around 6 decades. That’s an amazing figure considering there will be many bear market, crashes, economic recession etc that would have happened in that long time frame. Many people can get 40% return in a bull market. But can they do the same in bear market, when the market is going down and making new lows day after day. Can they still get an average 20% return? Although for few years, Warren Buffett has received a return of around 39% per annum and for some years as low as 5.9% per annum (during the 2008 recession). However, it is the consistent return of 22% per annum that has made him one of the richest people in this world. Moreover, it’s the power of compounding that has played a major role in making him rich. His net worth increased exponentially with time. There’s another example of a great investor and fund manager- Peter Lynch, whom we can consider to figure out the return can you expect from stock market. Mr Lynch was able to receive an average return of around 29% per year for a period of 13 years, when he was the fund manager at Fidelity Investments. That’s why he is considered as one of the greatest fund manager of all time. However, 13 years is too small compared to 6 decades of consistency shown by Warren Buffett. If you want to learn stocks from scratch, I will highly recommend you to read the book: ONE UP ON THE WALL STREET by Peter Lynch- best selling book for stock market beginners. Taking all these in consideration, we can conclude that an average return of 15-20% per year can be considered good in stock market. Do not try to make money fast. Try to achieve an average return of 20% per year first. Above this, everything is a bonus of your intelligent investment and an added fortune for your portfolio. Further remember that you get only get 4% simple interest return in your saving account. This return is way much higher than your saving returns. 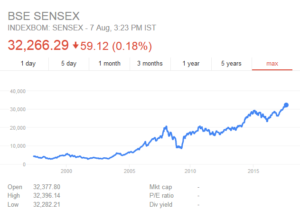 From the above graph, you can notice that Sensex has moved from 17,500 level in August 2012 to 32,300 current level (August 2017). Over the period of last five years, Sensex has given a cumulative return of around 85%. 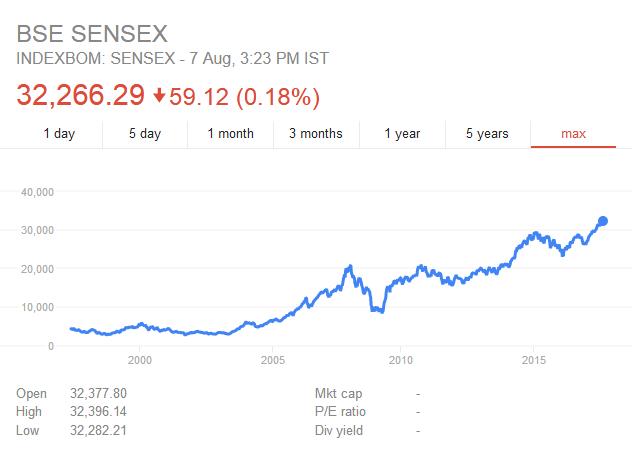 Now, if we consider from August 2002, Sensex was at 3000 level then. Hence, for the last 15 years, Sensex has given a return of around 960% (over 9 times). Overall, for the long term, Sensex has outperformed all the other investment options like saving, fixed deposits, gold, commodities etc. From the facts discussed in this post, a good return can you expect from stock market is around 15-20% per annum. This is in context with a retail investor. 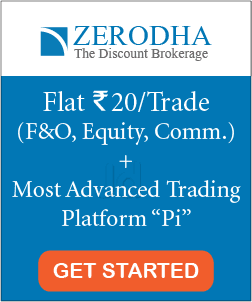 Any additional return above this can be gained as an added value because of the excellent stock selection and good fundamental and technical study of the stocks in your portfolio. Further, it’s not just the return that matters. The consistency in getting the returns year-after-year will help you in making huge fortune. Let me further explain how a consistent return of even 15% per annum for long term can help you to create great fortunes. Suppose you invested Rs 1 lakh in some good stocks at an age of 25. You remained invested till the age of 60. Therefore, the duration of your investment in 35 years. Your Rs 1 lakh investment at an age of 25, turns out to be over 1.33 crores at an age of 60 (considering the annual return of 15%). Further, this example shows just one time lump sum investment. Imagine the fortune that you can make if you can keep investing the same (or larger) amount year after year. You can easily create great wealth considering the decent returns from the stocks. That’s all. I hope this post on – “How much return can you expect from stock market” is useful to the readers. Do comment below what are your expectations from the stock market.